Saturday March 26th begins the 2016 NYC Participatory Budget (PB) voting process which runs through Sunday, April 3rd. 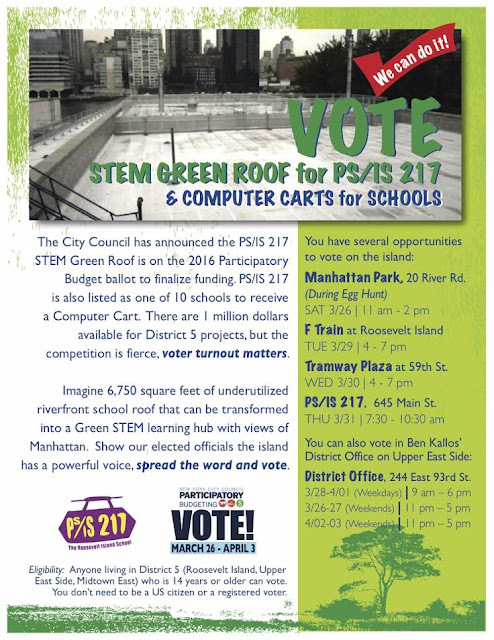 Of the fourteen projects on the ballot in our District 5 this year, two would fund Roosevelt Island projects, including PS/IS 217 computer carts and the balance of funding needed to finish the PS/IS 217 Green Roof. 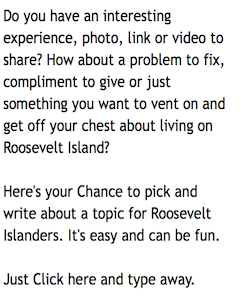 You can vote on or near the Island on Saturday, March 26 from 11am-2pm (during the RIRA Easter Egg Hunt) at Manhattan Park; Tuesday, March 29 from 4-7pm at the Island F subway station; Wednesday, March 30 from 4-7pm at Tramway Plaza (Manhattan side); or Thursday, March 31 from 7:30-10:30am at PS/IS 217. Absentee Ballot deadline tomorrow March 18. Order an absentee Participatory Budget ballot today or call 212 860-1950, deadline tomorrow, then vote by April 2nd. Anyone 14 or over can vote by mail or in person at our district office for the entirety of vote week.